Washington, NJ: Sanitary vibratory conveyors from process equipment manufacturer The Witte Co., Washington, New Jersey (www.witte.com), combine proprietary vibrating technology with continuously welded stainless steel troughs to effectively convey high value and sensitive materials while safeguarding against product contamination and protecting particle shape and integrity. Ideal for conveying food, beverage and pharmaceutical finished products and ingredients and other delicate materials, the sanitary vibrating conveyors feature the company’s own forced vibration drive system to create a gentle, efficient, linear conveying action suitable for low-maintenance, 24/7 operation. 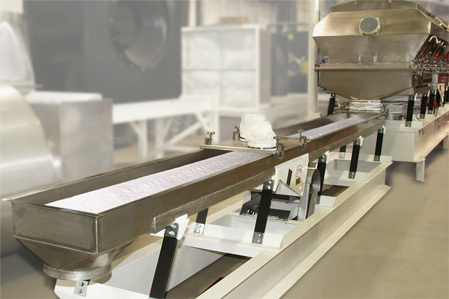 Designed to meet FDA, USDA and 3-A standards and regulations, the Witte sanitary vibrating conveyors eliminate the risk of contamination common to belt and roller conveyors as well as the risk to product and particle integrity common to pneumatic conveyors and may be quickly accessed or disassembled by one person for inspection and cleaning. The vibrating conveyors are available in 11”, 17” and 23” standard rectangular widths in lengths up to 40 feet and in custom sizes and configurations to suit a variety of product, process and plant requirements. Fully enclosed tubular trough designs are also available.